Sunflower Gliderport (identifier SN76, originally "Hutchinson Naval Air Station") is located south of Hutchinson Kansas. Bill Seed donated the gliderport sometime in 2013-2014 to a 501(C)(3), Sunflower Soaring Foundation. It is now owned by the Sunflower Soaring Foundation and operated/maintained by the glider clubs/members. 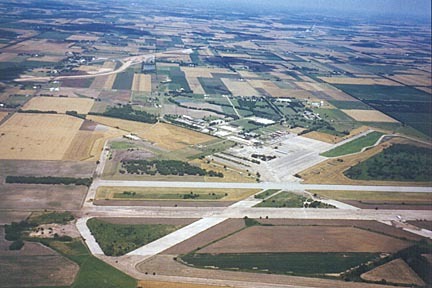 Certain sections of the property have been divided up and are owned by others, however the main ramp and 17/35 runway define Sunflower Aerodrome. This air field is a remnant of WWII from the 1940's. It is a real treat to fly gliders at this facility. The sheer size and history of the aerodrome has given glider pilots a place to make big things happen. Every year new and existing glider pilots flood the gliderport in the spirit of learning, sharing friendship, competition, and setting new personal best flights. The 17/35 runway is 7000' and thanks to Bill's generosity a good portion of the runway has received a new black top re-surface, in 2008. Members of the glider clubs and SSF have added coal tar sealant to the runway in addition to yearly crack sealing. Bill and the glider club members have invested time, property, and money with a passion for soaring abroad. Those of us that fly there couldn't be more fortunate to use such an enormous private field dedicated solely to soaring! Thanks to Bill and thank you to all of the hard working members. Each year, two $500 flight scholarships are awarded to young people who want to learn to fly gliders. Contact Tony Condon abcondon@gmail.com for more information. For a history lesson on the field, Click Here!